Do you suffer from bad breath, Halitosis and dry mouth? Then Thera Breath products are for you. Thanks to TheraBreath I had the opportunity to try some of their products. The company has been around since 1994 and was developed by Dr Katz. His teenage daughter suffered from severe bad breath problem. She tried everything from brushing and flossing 4-5 times a day and her breath did not improve. He experimented with different formulas and Thera Breath was developed. 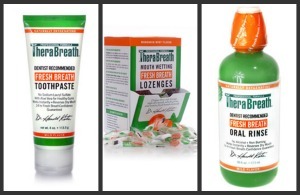 I have always had issues with bad breath and extremely dry mouth so I gave Thera Breath A try. When I first tried the toothpaste, I had to get used to it. I am used to toothpaste foaming in my mouth but the Thera Breath did not foam. Most toothpastes contain Sodium Laurel Sulfate and that is what makes most products foam. I felt that I had to use more of the product to brush my teeth. The taste was pleasant and my teeth and gums felt fresh. After brushing, I used the oral rinse and I was waiting for the burn that sometimes occurs with mouth washes. I was pleasantly surprised at the taste and consistency of the oral rinse. I was able to rinse and gargle for a longer period of time and my whole mouth felt clean and refreshed. Before I tried the Lozenges, I just used the toothpaste and the oral rinse for a few days and I found that they did help my breath. When I added the Lozenges throughout the day my mouth felt even cleaner and less dry. The taste was fantastic and dissolved evenly. They tasted so good that I had to only bring a few with me at a time other wise I would be eating them all day. Overall the three products were effective in controlling my bad breath and dry mouth. The only thing that I dislike is the texture of the toothpaste and I wish it was more foamy. So would you like to try the toothpaste and the oral rinse? Enter my contest. Thanks to Thera Breath, I can giveaway a bottle of oral rinse and a tube of toothpaste to ONE lucky reader. Contest ends on 3/26/11 at 11:59pm Eastern. Disclaimer: I was given free TheraBreath products for my honest review and I was not compensated for my review. Disclosure Policy. 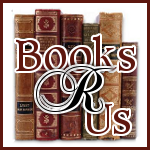 4 Like Books R Us via Facebook. Sarah S.
Never heard of this but would love to try for my daughter.